There isn’t a one size fits all when it comes to earning points, miles, and cash back. In fact, there are so many ways to earn these digital currencies that multiple forums have popped up to help the masses do just that (e.g. Flyertalk, Saverocity, Travel Codex). The best methods involve credit cards, but on occasion those methods get shut down and the credit card option becomes unavailable – at least in that avenue. If that happens, all’s not lost. There are many non-credit card methods to earn points, miles, and/or cash back, just in case the Y2K of the points and miles world happens. Throughout the past few years, there have been a number of mile earning debit cards on the market. However, in the past year alone, we have lost a lot of them. Fortunately, though, there are still two options: UFB Direct’s Airline Rewards Checking and Paypal’s Business Debit Card. UFB Direct’s Airline Rewards Checking account earns 1 American Airlines mile per two dollars spent. Since I value AA miles at about 1.5 cents each, this works out to about .75% cash back per dollar. That’s not a great earning rate compared to pretty much any credit card, but it’s something, especially since you earn those miles on actual PIN transactions. Paypal’s Business Debit Card earns 1% cash back on all signature purchases, which is very similar to a credit card. PIN transactions do not earn anything, so this card is primarily useful for online purchases (e.g. Loading Serve). Certain banks offer sign-up bonuses when opening a new bank account. Sometimes this can be cash and sometimes it can be points or miles. To go along with the debit cards I just mentioned, UFB Direct does offer a 1,000 AA miles sign-up bonus if you direct deposit $1,000 in a calendar month. As a side note, when I last signed up for an account with UFB (October), I received a $10 Amazon gift card in my email. I didn’t see that mentioned anywhere, but I was happy to receive it. Certain stores, such as Aldi, do not allow the use of credit cards. 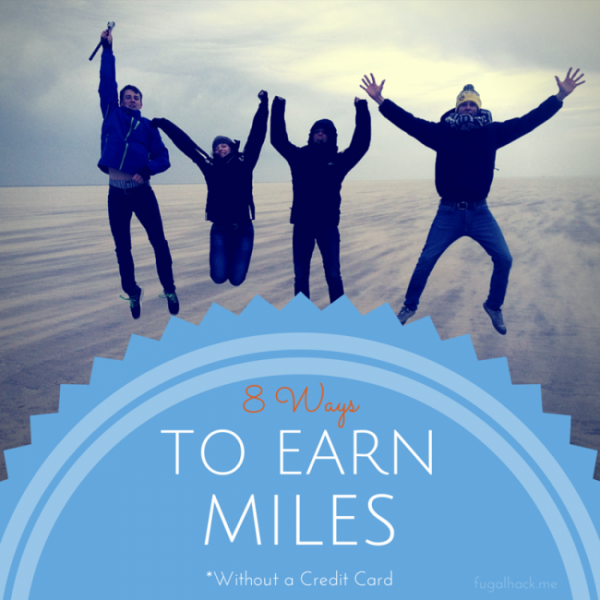 They only accept debit cards, but that doesn’t mean you can’t earn miles. You could use rewards-earning debit cards, as mentioned above, or you could use gift cards. Gift cards can usually be purchased with a credit card in many stores, which means you can earn 2-5X points if you maximize your rewards. Those gift cards can then be used as a debit card, since they can have PINs added to them. Yes, this method does involve using a credit card, but it also helps you earn points when shopping at stores that only allow debit. This one may seem obvious, but it’s important to mention. Traveling is an easy way to earn points, as long as you’re registered for the airline or hotel’s rewards program. For example, all hotel stays and airline tickets that you pay for earn points or miles. This is the old fashion method of earning, but it’s still an option. You can earn miles in a number of programs, simply by dining out. Rewards Network has partnered with many travel companies including, but not limited to, American Airlines, Delta, and Alaska Airlines to provide miles for restaurant purchases you already make. The process to earn is simple: First, sign-up for the program(s) of your choice and link your cards (these can be debit or credit). Then, go out to eat at a participating restaurant and use the card(s) you signed-up with to pay. It’s that easy! Reselling is a great way to earn a steady side income with little work, but that’s not the only thing it’s good at. It’s also a great way to earn extra points, miles, and cash back simply by using shopping portals. When I track my reselling profit, I do not include any rewards earned through portals in my calculation. That means anything I earn by using portals is purely a bonus. Portals are not only for resellers, though. They’re also great for regular shopping, especially around the holidays. Many travel companies offer promotions throughout the year that give you the ability to earn points or miles by completing tasks. For example, last month Cadillac partnered with American Airlines to offer 7,500 AAdvantage miles for test driving a car. The promotion was short lived, probably because so many people took AAdvantage of it (lol), but it was still a great way to earn miles if you got in on the deal! The best thing you can do to know when these promotions happen is to watch social media. Many companies will release these on their Facebook or Twitter pages, so follow them and watch for the deals! Certain companies, such as SPG, offer bonuses when you transfer points or miles. For example, when you transfer 20,000 SPG points to a participating company, SPG throws in an extra 5,000. That works out to an extra 25%!